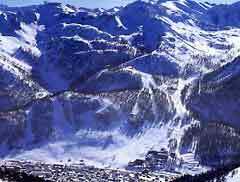 Found two kilometres from the Italian border, Montgenèvre is the one French direct link into the massive Milky Way network, with its hundreds of kilometres of pistes. At 1860m, this small resort has a very good snow record, ski-to-your-door accessibility and cheap and cheerful accommodation and restaurants. Queues are absent in the week, but can grow with the influx of French and Italian day-trippers at the weekend. The skiing at Montgenèvre is fine for beginners and intermediates, but better skiers and boarders will have to head for more challenging skiing over in Italy. The advantage of heading to Italy is also one of economics – everything is a fair bit cheaper. The mountain restaurants are slightly better, too. However, the link to the Milky Way is time-consuming - you may have to spend a fair amount of time getting to the area you want. Once you get off the main road in Montgenèvre, there is a lovely old village to explore. There are not many other non-skiing activities. In the words of one visitor: 'the main club could just about fit into my bathroom'. Others talked of the après-ski as being rather quiet. Overall, Montgenèvre is a good budget venue by French standards. Access to the Milky Way and the frugality of Italy is hugely beneficial. It offers no frills, but great snow and, if you have a car, excellent skiing is always accessible in neighbouring resorts. 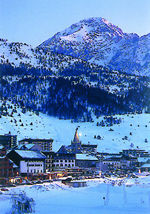 Reasonable value French resort with a traditional centre. Great skiing in the Milky Way.